The nation’s major steelmakers are diversifying into non-core businesses such as energy, construction and agriculture to shore up falling profits. POSCO, the world’s fourth-largest steelmaker by output, has cut its number of subsidiaries to 46 from 70 as of Jan., 1 mainly by merging those with overlapping businesses, the company said in a press release. The number of POSCO’s affiliates surged after takeover deals for the past few years, including Daewoo International, a trading company specializing in oil and gas exploration overseas, in 2011. “On the group level, POSCO has driven in-house reorganization since March last year under the three principles of strengthening core businesses, trimming overlapped businesses and closing non-core businesses without cutting personnel,” a company official said. The steel giant will wrap up the reorganization by the end of this year and the number of its subsidiaries is expected to be cut to 30. 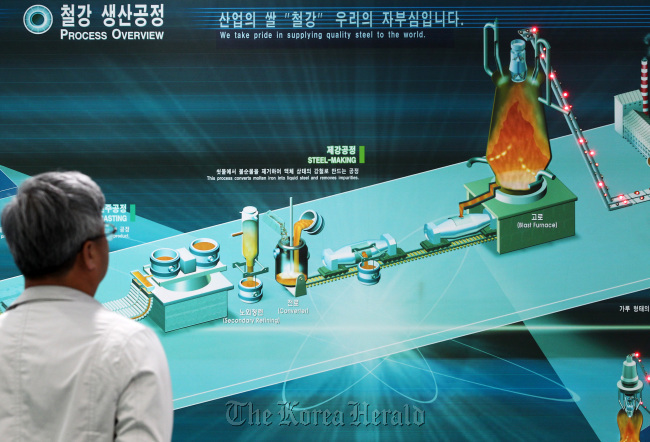 “The POSCO streamlining came amid diversification of its business portfolio into non-steel sectors,” Byun Jong-man, an analyst from Woori Investment and Securities, said. New areas that POSCO has invested in are energy, materials and infrastructure-building overseas. The stock market has responded positively. “POSCO is still heavily dependent on its steel business, but it has showed gradual improvements. The ratio of dependency on steel in operating profit is expected to fall 2 percent to 76 percent in 2012 from 78 percent in 2011,” Byun said. Diversification has become a common word in the Korean steel industry, except for at Hyundai Steel, the nation’s second-biggest steelmaker, which is owned by Hyundai Motor Group. Hyundai Steel managed to achieve its growth target last year thanks to robust demand for steel products from Hyundai Motor Co., the steelmaker’s biggest buyer. Like POSCO, Dongbu Group, led by its core affiliate Dongbu Steel, the nation’s third-largest steelmaker, is increasing diversification into sectors ranging from information and technology to electronics and even agriculture. Dongbu Steel focuses on making steel plates for shipbuilding. With the shipbuilding industry hit by the economic downturn in Europe, speculation arose last year that Dongbu Steel was on the brink of applying for a debt workout. “As the steel industry tends to be sensitive to economic cycles, steelmakers have no choice but to secure other stable income sources to buttress operating profits amid the protracted global economic downturn,” Byun said. POSCO’s operating profit deteriorated throughout 2012 as steel prices continued to fall due to dwindling demand from major steel-consuming industries like construction and shipbuilding, while raw material costs rose. The steel giant’s operating profit fell 18 percent to 1.062 trillion Korean won ($963 million) in the third quarter of 2013 and the company said further deterioration in its earnings is expected in the fourth quarter. Market watchers said business diversification of steelmakers was a global trend in the face of a stalled market. For instance, Wuhan Iron & Steel, a leading Chinese steelmaker, jumpstarted the trend early last year as it announced it would enter a lucrative and stable hog-raising business in China. Despite the strong need to secure stable income sources beyond steel, concern over diversification in the steel industry is also arising.